So I had a happy little blog… no one really paid attention, but I didn’t much care because I was happy. (None of the log analyzers I found would make a plot like this so I made it myself by parsing the log file itself, script is on github). So obviously, Reddit made the whole thing go crazy, including bringing my site down… but there’s lots of other interesting insights here. 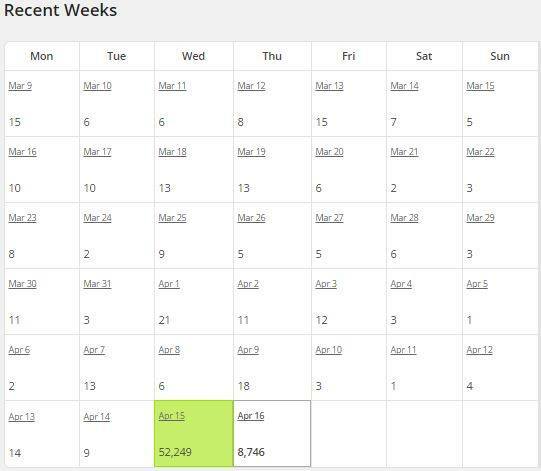 From this graph, it’s clear to tell that the Reddit traffic came like a storm, and left like a storm… leaving in its wake a bunch of facebook and twitter hits (twitter wasn’t visible in my log btw… apparently they mask themselves, so you’ll just have to take my word for it that the traffic pattern was just like facebook’s, if a little lower). 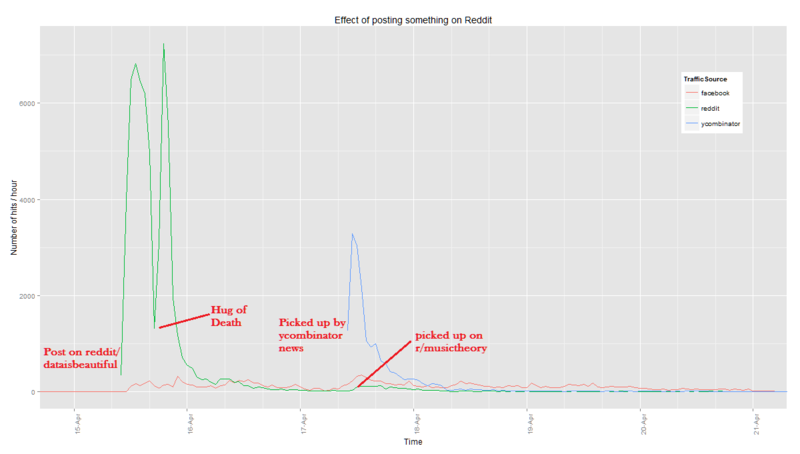 Then some days later, someone posted on YCombinator news, which had an immediate effect of having the facebook traffic jump a bit, and even someone reposting on reddit, this time in the Musicaltheory sub (although it was the weekend, so hard to establish causality). What is interesting is how quickly reddit and ycombinator traffic falls below the facebook/twitter slow-and-steady approach, and how (at least in this case) it never really “blew up” on facebook, but did the ‘long-tail’ did last a loooong time. The first link is the article itself, and the other two are css files on the theme that I’m currently using on my blog. How are these “referrers”? And why can’t I see any of the Twitter traffic that I expect?